On Saturday, September 22, 2018 at 6:45 pm an alert citizen called into the Fairfield Police Department dispatch center to report a female with a handgun in a business around the 1300 block of Travis Boulevard. The caller advised that the female removed a small semi-automatic handgun from her purse and placed it on the counter before placing it back in her purse and leaving the business. The caller said the suspect appeared intoxicated and did not threaten anyone with the gun. With the assistance of security on sight they were able to direct incoming Fairfield Police Officer’s to the suspects location. The suspect was stopped and appeared to be under the influence of alcohol. 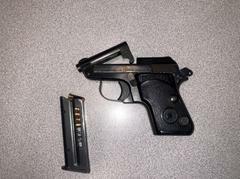 A search of her purse revealed a black Beretta .22 cal semi-automatic pistol. A loaded magazine was also recovered next to the handgun; fortunately every round was loaded backwards! Arrested was 27 year old female resident, Rocio Galindo Vargas. Vargas was booked into Solano County Jail for illegal possession of a firearm and being intoxicated in public. Thanks to the quick response of an alert citizen, Fairfield Police Officers were able to remove one more illegally possessed firearm off our streets. This is another great example of our community members working together with the men and women of the Fairfield Police Department. Photos of the suspect were not available at the time of this release.